Yay, its reveal day again. I've realized that over the last couple of months I get really excited as the SRC reveal day approaches. This month is no different. I can't wait to see what everyone's cooked up. The Secret Recipe Club is so much fun. It started off as the brain child of Amanda from Amanda's Cooking and because it got so very popular and grew so fast, we've been split into groups. I'm in Group B and Tina from Mom's Crazy Cooking is our hostess. If you'd like to participate or see our previous reveals, stop by at The Secret Recipe Club. This month I was assigned Julie's blog, Little Bit of Everything. 'Hi Julie'! I had so much fun going through her blog. You simply have to head over. There were so many things that I wanted to try. And you know something, she dabbles not just in food, but like her blog name suggests, in a little bit of everything. I absolutely love the pictures of her garden. She has a series called In My Garden where once a week she posts some of the most gorgeous pictures. I absolutely love these kind of pictures and have tonnes of such images captured from when I travel. I've just recently launched Shutterbug Sundays on my blog in an attempt to gather such clicks in one place. But I digress. Back to my pick for this months SRC. 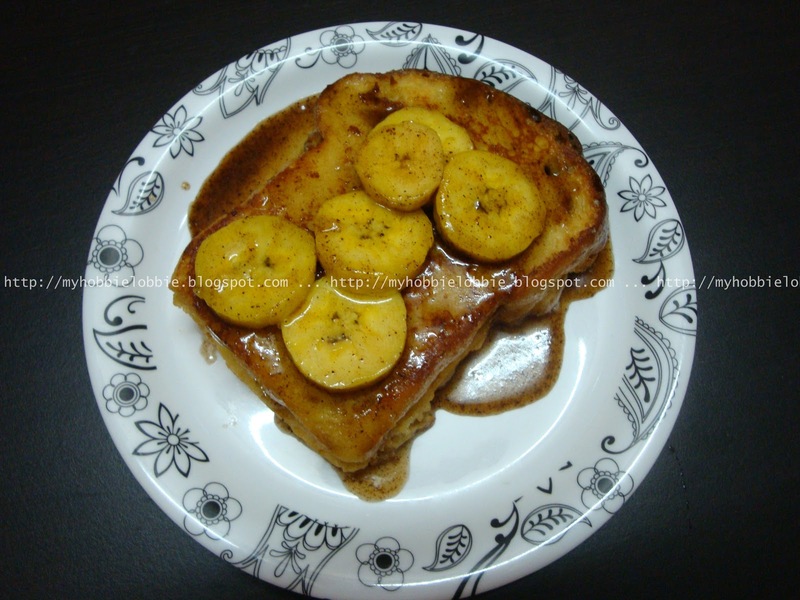 I saw Julie's version of the World's Best French Toast and I was hooked. I knew I was going to try this out. I've seen a few versions of Stuffed French Toast on some television shows, but I've never tried them. This was the perfect opportunity. I've actually combined ideas from a couple of Julie's recipes, her Peanut Butter Banana Muffins and the World's Best French Toast to come up with my very own version of Stuffed French Toast. This is a wonderful treat to serve up for breakfast on the weekend or a holiday. I think its a really healthy breakfast treat. It has absolutely no sugar in it. It gets its sweetness from the plantain and the honey. I love how this turned out. There are so many wonderful combinations that can be used to tweak a treat like this. I know I'll be trying many more. Thank you Julie for the inspiration. Spread the peanut butter on both the slices of bread and sandwich them together. Beat the egg, milk, vanilla and salt in a bowl. Dip the peanut butter sandwich in the milk and egg mix and let it soak it up. Turn it over so that the other slice soaks up some of this yummy stuff too. Place a dollop on butter on the pan. When it has melted, fry the french toast till nicely crusted and browned to your liking. Place it on the serving plate. Once the french toast is done, using the same pan, add a touch of butter. Add the honey and cinnamon and stir well. When this mix starts bubbling, add the banana slices and cook it off for a minute or two. Avoid overcooking or the bananas will get too soft and mushy. Pour this sauce over the French Toast and sit yourself down to a wonderful, healthy treat for breakfast. If desired, you can sprinkle some icing sugar on top before serving. Do stop by and check out what the other members of Group B have made this month. Mmm, I love stuffed French toast but I've never tried making it myself. This recipe looks simple and amazing! Can't wait to try it! Thank you Amanda! I hope you enjoy it as much as we did! This looks so yummy, makes me want to make it as soon as possible. I love stuffed French toast and it would be perfect for family brunches. Thanks for picking it this month for SRC - what a great recipe! Thanks for stopping by Nicole and for your lovely comment! Thanks for stopping by Tandy! Yes please! Love that sauce! Looks delicious! Yum! I haven't had french toast in too long, I wish I could have this for breakfast right now! Happy SRC reveal day! My kids would love this ooey gooey stuffed french toast - great choice for SRC! We would just love this Stuffed French Toast, it looks so good! Thanks for sharing and it is fun cooking with you in the SRC! Delicious and mouthwatering French Toast. Lovely preparation. Yowza! Look at that! Fantastic!!! What a yummy looking recipe - "stick to your ribs" kind of food. Great SRC pick! Hope you'll stop by and see my Mocha Snow Caps. Oh, man! I am going to have to make a GF version of this right away! That looks AMAZING! Thanks so much for sharing. Thanks for stopping by my blog earlier. I can't wait to check out all the yuminess on your blog! Thanks for the lovely comments on my blog! The french toast looks amazing! My son LOVES french toast! Thanks for participating with us in the SRC and if you haven't already please hop on over and check out my Frozen Breakfast Burritos! There is a restaurant in San Diego that has something similar on the menu. I always splurge and get it. Yours looks just as good. Knowing I can make this at home may be big trouble. Yum! Thank you everyone for stopping by and for taking the time out to leave such lovely comments. It makes my day! I only eat PB&J toasted, so I'm sure I would love PB in French toast! What a great idea! I saw this stuffed french toast yesterday but I cannot stopping by but I want to say you look absolutely delicious Trisha , gloria!!!! and Im following you Trisha! Thank you Melanie and Gloria!!! Oh my, looks wonderful and totally impressed that you make the brioche too. Thank you Lisa ... I've just started off baking yeasted breads and its so much fun! Peanut butter in French Toast sounds amazing. I love this variation!! Now that looks like a fabulous weekend breakfast to me! Great SRC post! Thanks Kristen, Amy and Patsyk! I've always wanted to try stuffed french toast but I never have! This is definitely making me want to make it for breakfast this weekend! Thanks for stopping by Louisa ... I hope u enjoy this as much as we did! This reminds me of a breakfast dish I get at a local European restaurant.... yum! These look so good!! I definitely am going to try and I am definitely will be following your blog.. If you would check out mine to that would be so great. And follow me also, I am kind of new to this but excited to share great recipes..